Victor Moses, Alex Song and Emmanuel Emenike return to parent clubs after loans end. Elliot Lee, Joey O’Brien, Jordan Brown and Leo Chambers released. Havard Nordtveit joins from Borussia Monchengladbach on a free. Toni Martinez joins from Valencia for €2.4m. Winger Sofiane Feghouli joins on a free from Valencia FC. Michail Antonio and Aaron Cresswell sign new contracts. Winger Gokhan Tore joins on 1 year loan from Besiktas. England under 20 international Ashley Fletcher (forward) signs 4 year deal from Manchester Utd. Left-back Arthur Masuaku joins from Olympiacos. Forward Andre Ayew joins from Swansea for £20.5million. Argentine striker Jonathan Calleri joins on a year long loan deal. US Tour - 05th Seattle Sounders - 0-3. US Tour - 12th Carolina RailHawks - 2-2. 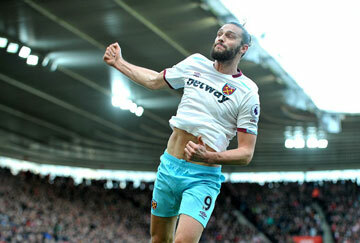 Reid, Carroll. Austria Tour - 19th FC Slovacko - 2-2. 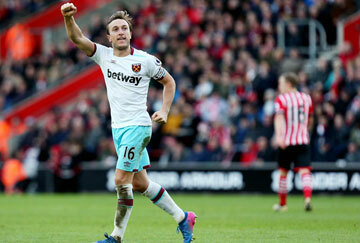 Noble, Fletcher. Austria Tour - 20th Rubin Kazan - 0-3. Austria Tour - 23rd Karlsruher SC - 3-0. Noble, Fletcher, Feghouli. 07th Juventus (h) - 2-3. Carroll x2. 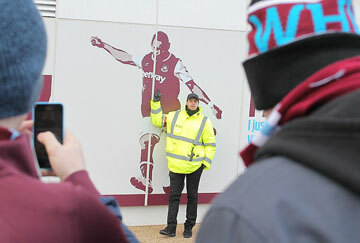 The London Stadium officially opens. 28th NK Domzale - Slovenia (a) 3rd Q.Rd. 1st Leg - 1-2. Noble (p). ★ 4th NK Domzale - Slovenia (h) 3rd Q.Rd. 2nd Leg - 3-0. 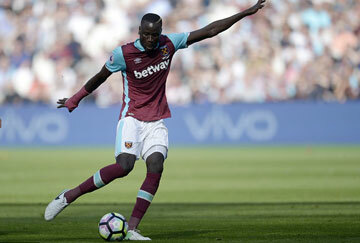 Kouyaté x2, Feghouli. London Stadium as it now seems to be known. A new record attendance for West Ham - 53,914. ★ 18th Astra Giurgiu - Romania (a) 4th Q.Rd. 1st Leg - 1-1. Noble (p). ★ 25th Astra Giurgiu - Romania (h) 4th Q.Rd. 2nd Leg - 0-1. Out of the Europe to the same team who put us out last season! Poor performance on the night. ★ 15th Chelsea (a) 1-2. Collins. Injuries; Ayew out for 3 months and Carroll for 3 weeks. ★ 21st Bournemouth (h) 1-0. Antonio. LP:10th. 57,000 attend first ever premier league match at the London Stadium! and striker Simone Zaza joins on a season loan from Juventus. ★ 27th Manchester City (a) 1-3. Antonio. Antonio called up to the England squad. Transfer window closes with the signing of defender Alvaro Arbeloa from Real Madrid on a 1 year deal. ★ 10th Watford (h) 2-4. Antonio x2. LP:17th. 2-0 up after half an hour, then fell apart! 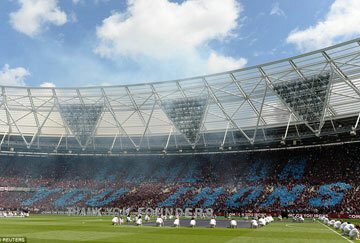 New stadium... same ole West Ham! ★ 17th West Bromich Albion (a) 2-4. 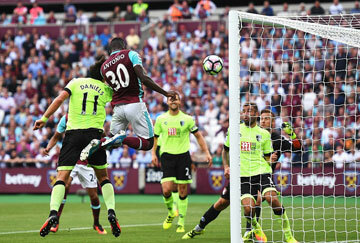 Antonio, Lanzini (p). 21st Accrington Stanley (h) EFL Cup 3rd Rd. 1-0. Payet. ★ 25th Southampton (h) 0-3. LP:18th (3rd from bottom). ★ 01st Middlesbrough (h) 1-1. Payet. ★ 15th Crystal Palace (a) 1-0. Lanzini. ★ 22nd Sunderland (h) 1-0. Reid. LP:18th. ★ 26th Chelsea (h) EFL Cup 4th Rd. 2-1. Kouyate, Fernandes. ★ 30th Everton (a) 0-2. ✈ 05th Stoke City (h) 1-1. OG. 2-1 up with 8 minutes to go! Kane double, then Reid sent off! ★ 27th Manchester Utd (a) 1-1. Sakho. Sakho marks his first appearence of the season with a goal, then gets injured! ★ 30th Manchester Utd (a) EFL Cup 5th Rd. 1-4. Fletcher. Cresswell and Antonio both go off injured. Sakho out for 6 weeks! Kouyate out! ★ 10th Liverpool (a) 2-2. Payet, Antonio. Antonio and Cresswell back. 0-1 down after 5 mins, 2-1 up at HT, hung on for much needed draw. ★ 13th Burnley (h) 1-0. Noble. ★ 17th Hull City (h) 1-0. Noble. LP:13th. ★ 26th Swansea (a) 4-1. Ayew, Reid, Antonio, Carroll. LP:11th. ★ 31st Leicester City (a). 0-1. ★ 02nd Manchester Utd (h). 0-2. Ref. Mike Dean sends off Fergouli after 15mins, card overturned in the week! ★ 6th Manchester City (h). FA Cup 3rd rd. 0-5. Another piss poor lack-lustre performance in the same vain as the Arsenal game! we turn down a bid from Marsielle. 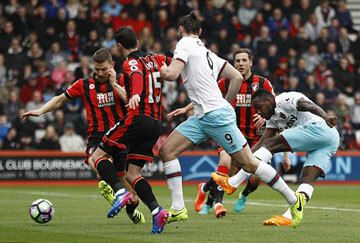 Payet is dropped and the team put on a second half show with a wonder goal from Carroll. Simone Zaza leaves to join Valencia after a disappointing loan spell. Defender Jose Fonte moves to West Ham from Southampton. Midfielder Robert Snodgrass joins from Hull City. Dimitri Payet gets his wish and leaves West Ham for Marseille. ★ 31st Manchester City (h) 0-4. 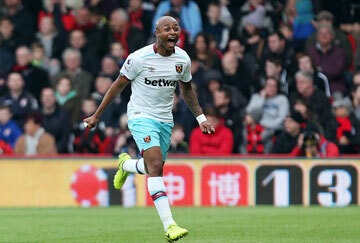 Ayew and Kouyate return from African Cup of Nations. ★ 11th West Bromich Albion (h) 2-2. 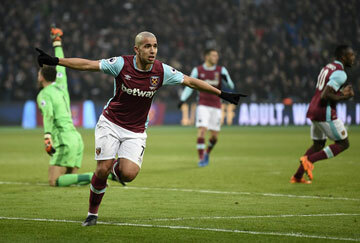 Feghouli, Lanzini. ★ 25th Watford (a) 1-1. 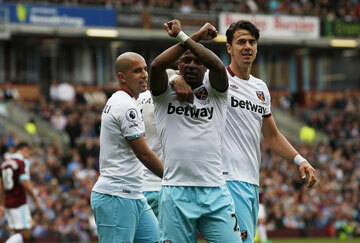 Ayew. ★ 04th Chelsea (h) 0-2. ★ 18th Leicester City (h) 2-3. Lanzini, Ayew. Obiang... out for the rest of the season, Reid... out for 6 weeks, Antonio... out for 4 weeks! Bilic gets the dreaded vote of confidence from the board! ★ 05th Arsenal (a) 0-3. ★ 08th Swansea City (h) 1-0. 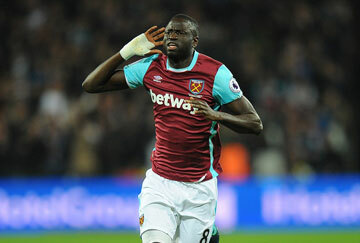 Kouyate. Antonio joins Obiang, and is out for the rest of the season! ★ 15th Sunderland (a) 2-2. 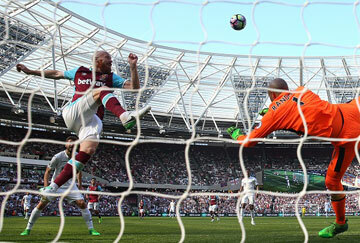 Ayew, Collins. ★ 22nd Everton (h) 0-0. ★ 29th Stoke City (a) 0-0. 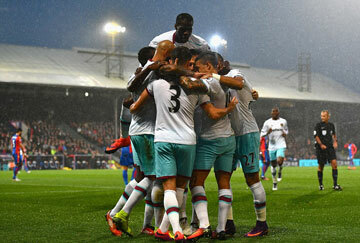 Any threat of relegation put to bed while Tottenham's slim hopes of winning the league are over... a great win! ✈ 13th Liverpool (h) 0-4. Our first season in our new home, the London Stadium. A season blighted with unrest in the stadium, injuries, player turmoil, a brush with relegation, but also contained a few unbelivable highs! Things got off to a bad start when 20 million signing Ayew was injured in our first game at Chelsea, putting him out for half the season. 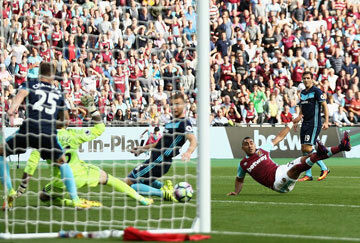 Antonio (who ended up Hammer of the Year) scored the first league goal at the London Stadium for our first win. After that it was up and down as the team struggled to find the form of last season. December found us dropping into the relegation zone, but somehow the team managed to pull off 3 wins to ease worries. The humour of the fans coming out as after Hull had hit the woodwork numerous times in out 1-0 win the post was voted the "man of the match". Something was clearly not right and in January we found out why when Bilic announced in a press conference that Payet had told him he no longer wanted to play for West Ham. 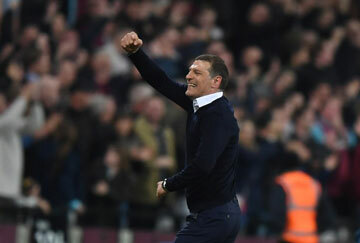 We know we are not the best team, but we are a great club, and it was at this point that the support pulled together, the in-fighting over the stadium stopped and in the next game Bilic's name echoed around the stadium, a clear indcation of the support he had from the fans. 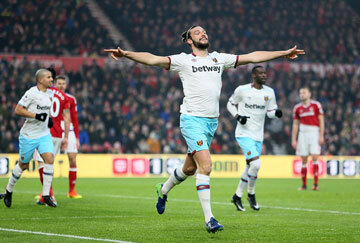 The team responded with a 3-0 win over Palace, the second goal an absolute peach from Andy Carroll (my highlight of the season!). Again form was patchy with continual injuries to key players coupled with letting in last minute goals saw us approaching the relegation zone again, but the last seven games saw us lose only once, beating Tottenham along the way (to end their hopes of winning the league), and saw us finish 11th, which all things considered, wasn't too bad! 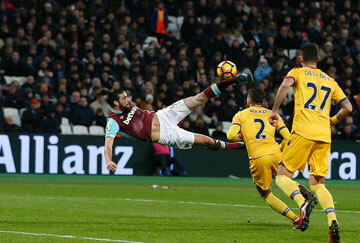 Match of the Day's "Goal of the Season" final eight selections featured two West Hams goals, Payet's individual effort against Boro and of course Carroll's overhead thunderbolt against Palace.